Welcome to anthonylanni.com! 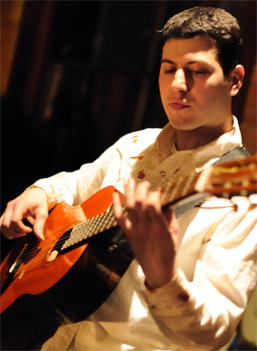 Anthony Lanni is a New York City based jazz guitarist, who specializes in Brazilian music. Anthony performs traditional Brazilian music in the Samba, Bossa Nova, Baiao and Bolero styles, with compositions by Baden Powell, Vinicius de Moraes, Antonio Carlos Jobim, Arsenio Rodriguez, Milton Nascimento and more. The music is highly rhythmic, beautiful, and rich in harmony and melody. Anthony performs either as a solo artist, or in small combos (duos, trios, and quartets), and is available for performances at music venues, restaurants, and private events and also gives guitar lessons. Visit the music page to hear some recordings of Anthony's traditional Brazilian music project. Additionally, Anthony also has another project with a band called, Os Clavelitos. Os Clavelitos is a 6-piece "American Samba" band whose original music combines traditional Brazilian rhythms (samba, baiao, bossa nova, and frevo) and English lyrics. The band also performs traditional Brazilian music sung in Portuguese and can also perform as a trio. For more information on Os Clavelitos, go to http://www.oscavelitos.com. To contact Anthony regarding bookings, lessons, or performances, e-mail him at anthony@anthonylanni.com, or call him at 718-344-9146.